« THE ABSENCE “ENEMY UNBOUND” – RELEASES SEPTEMBER 14, 2010! TRACK LISTING & ALBUM ART! This entry was posted on July 24, 2010 at 12:46 am and is filed under guitar legends, hard rock albums, hard rock bands, hard rock music, Heavy Metal, heavy metal albums, heavy metal bands, heavy metal history, heavy metal music, metal odyssey, Music, rock music with tags 1980's heavy metal albums, 1980's heavy metal bands, all systems go album 1988, all systems go album review, hair metal music, hard rock music, heavy metal guitarists, heavy metal history, heavy metal music, metal odyssey, Music, old school heavy metal, rock music, vinnie vincent invasion. You can follow any responses to this entry through the RSS 2.0 feed. You can leave a response, or trackback from your own site. Ha ha! good find – I was just rummaging through my vinyl collection and unearthed two copies of this gem. *I’ll admit though, it’s been a while since I heard it on CD. Mr. Cusano was/is the shredder. I got to see him with KISS in Indiana. Midwest Concert trivia: it was on the very last date of the tour too! 03.17.84 in Evansville,IN. – Roberts Stadium. Love some of the “Creatures of the Night” LP (even though Ace is shown on the LP). Some of “Lick it Up” was cool (Gene blew my ears out and made my stomach quesy) -due to the massive low-end during his (in)famous bass solo. The “Creatures Of The Night” scenario is so bizarre to me… ‘nuthin like giving credit where credit is due with the album cover!? I think there are many of us out there, who wish/would like to see a Vinnie Vincent comeback right about now. Heck, what better time than now with the huge resurgence of Old School leading the charge! I’ll start off by saying I really liked Vinnie during his short time in KISS. I think he was a good fit. Creatures of the night is easily the most underrated album of their career. Lick it up might be my favorite non-make-up album. Okay, the reality is VVI were horrible. The first album was Vinnie going off on a big soulless wankfest. The second album is even worse though. Even less direction and more tuneless meandering. I have had the misfortune of hearing both albums in say the last three years. I had not either in a while and gave them a chance. My ears suffered greatly for giving them another chance. I’ll describe this album as finding cat puke behind the couch after it has sat there for a year drying and acculating mold, fuzz and other assorted nastiness. Ouch. Plus, I have a cat and never want to find that “stuff” behind my couch! I have to agree with Metal Mark on this one. I’m not a fan of the legions of shredders that hair metal thrust upon us and Vinnie Vincent is a particularly serious offender. However, Kiss constrained him enough that his lack of direction didn’t get entirely out of hand (or maybe it was ankh that controlled him). Once he was on his own though, all bets were off. The first VVI barely had songs. It was more like filler around guitar solos. All Systems Go was even worse, because the solos weren’t even exciting from the point of view of sheer exercises and the “songs” were even less interesting. I like the VVI albums to an extent. 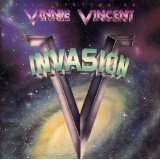 It’s true that Vinnie just went off into his own guitar world on these albums but there’s still some good tracks on both releases. I was actually just reading some article somewhere on Vinnie Vincent last week. I really wish we could at least get to hear the stuff that was never properly released. C’mon, Vinnie, stop filing lawsuits and start making music again! I COMPLETELY disagree with a few of the earlier posts,.This Album ROCKS,.Maybe they didn’t “really” listen to BURN and BREAKOUT among others,.Kickstart My Heart totally rips off the intro to BURN as well,.Those songs absolutely push Metal, Glam, Musicianship, and Production to all-out levels,.